A.E.D. 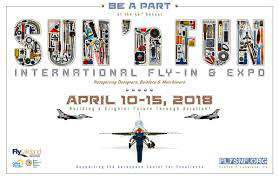 is returning to Sun n Fun for the 44th Annual International Fly-In & Expo after missing it in 2017. This annual event is the second largest of its kind in the world. Last year saw approximately 200,000 guests from 60 different countries, 510 Exhibitors and over 8,000 aircraft movements. This is a 6 day event held in Lakeland Florida on 2,200 acres. During the week of the show Lakeland Linder Regional Airport, where the event is held becomes the "busiest airport in the world." A.E.D. will be there to review our products and services to the sport aviation market. While we will continue to focus on our fabrication materials, 4130 tube and sheet, aluminum products and streamline profiles, this year we will be showing our line of Mister Tig AC/DC portable tig welders, perfect for the home hobbyist or the professional maintenance team. AED will also be selling the Valco Cincinnati line of consumer products, polishes, assembly lube, adhesives, silicones, solvents and cleaners, and other fabrication tools. Be sure to stop and visit A.E.D. at booth B-077, indoors, during this years Fly in, from April 10th to 15th. in Lakeland Florida.